With faster computers, better networks and improvements in software, you can now play live dealer Blackjack games from your computer. The interface includes a table, attractive croupier and the ability to bet and choose your actions with your mouse. There is a social element to these games, where you’ll be able to chat using a text box with both the dealer and the other players. In this article, you’ll learn how live dealer online Blackjack games operate. First of all, you will see how these games are set up and what is the relationship between the studios and casinos. Next, we will walk through a typical hand, focusing on the important factors to keep in mind. After that, we will list some of the best casinos where you can find live dealer blackjack games. Not many casinos are big enough to have their own live dealer studios, as they have big costs in terms of wages, setup, and technology. Instead, there are specialist companies including Evolution Gaming and Vegas Interactive Gaming, that run these studios. The studios are located around the world, with a focus on lower cost countries. Examples include San Jose, Costa Rica, Riga in Latvia or the Philippines. Casinos then license the games and integrate them into their software. You do not need a separate log-in or to visit a separate website to access these games. Larger casinos, such as BetOnline, have their own dedicated tables within the studios. These are branded with the company logos, and dealers sometimes wear branded clothes too. You will find that the stakes for these games are a little higher than for the games you play against the computer. This helps to cover the additional costs of the studio and video streams. 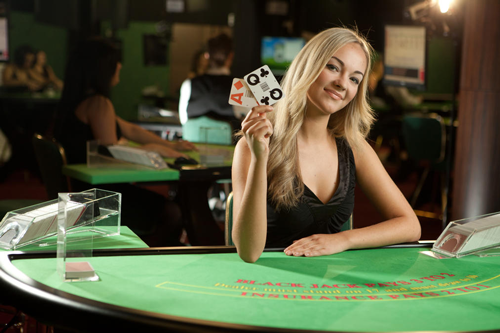 There are two different live dealer blackjack games to choose from. These are the standard 7 seat games like you would find in a live casino, and sometimes a separate 1-to-many game, where everyone bets on the same hand. 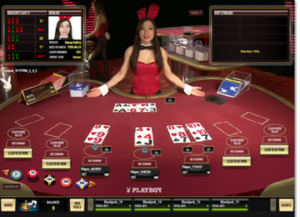 It is the main live dealer blackjack game, and when you join a window will pop up with the stream of the table at the top and chips, action buttons and the betting grid below. Most studios use large cards so that you can clearly see what has been dealt. You’ll place your bet (often minimum $5), and be dealt into the game. Usually, the format is the standard US rules, with a peek for blackjack, an offer of insurance when an Ace shows as the dealer up card and liberal splitting and doubling rules. You’ll indicate your actions with your mouse, hitting or standing as appropriate, or adding another bet to double. The dealer will then give you another card as needed at the live table. Once all the players have finished (this will naturally be a little slower than the ‘virtual’ equivalents) the dealer will draw cards according to the rules laid out. Once the outcome is decided, the bets will be settled automatically, cleared and the next hand can begin (you can hit re-bet). All of these games have a chat box, which you can type in to interact with the dealer and / or the other players. Sometimes you will get a lively game, especially when people are winning a lot of hands together. The dealers cannot type into this box (they are too busy), instead, they will respond verbally to you. The alternative one-to-many game is a single hand against the dealer, this is less social, though it does go a lot faster as you’ll not have to wait for several people to complete their betting each time. You will also find exclusive high-roller tables at live dealer casinos. Blackjack is not the only game available at these studios. You’ll find Roulette, Baccarat, Casino Holdem and Sic-Bo also offered. Live games at online casinos have a lot of advantages, including bonuses and other forms of discounts. Casinos handle their live promotions differently, some offer a special deposit bonus on top of the other standard deposit bonus. Sportsbetting Live Casino, for example, has a risk-free bet in the live casino as an introductory offer. Live casinos have hostesses which walk the floor offering special bonuses that have nothing to do with the welcome bonuses. For instance, some ask trivia and give out bonus money to those who answer the question first. Online blackjack with real dealers has one huge advantage few people talk about, though. Live dealer blackjack introduces more than camaraderie and attractive dealers, though. When you play hands of blackjack online with live dealers, you use real cards dealt from a shoe, so you can count cards like you would in a land-based casino. Everything happens in real time and the live casino only shuffles the cards when 75% of the deck is gone, unlike online casino RNGs. Card counters, therefore, have a chance to gain an advantage. To count cards, the live online blackjack cannot be reshuffled every single hand. It’s easy to see if this happens because live casino games use multiple cameras to provide video of every second of action from multiple angles. You’ll know within a few hands if card counting is possible. The best live blackjack casinos offer an immersive experience played at the same speed as blackjack in a brick-and-mortar casino. That means card counting is possible. Remember to use basic strategy and a dependable counting method to gain the advantage, then raise bets when the deck is in your favor. The best live dealer online blackjack casinos for non-US players use Evolution Gaming Live software, because of the sheer number of games and huge bet limits offered. In the space below, I’ll detail two casinos which use Evolution Gaming: Betway and 888 Casino. Choose the casino site which is licensed for your country, or which has the best bonuses for you. Betway’s live dealer blackjack online streams in real time from the Hippodrome Casino in London. Betway Live uses Evolution Gaming software, which has the largest number of live dealer games in the online gaming industry. Evolution provides live baccarat, live blackjack, and live roulette. It offers live dealer versions of table poker like Casino Hold’em, Ultimate Texas Hold’em, Three Card Poker, and Caribbean Stud Poker. Players even have access to Live Dream Catcher. The rich features include unique multi-camera immersive roulette, side bets, and multi-game play. Players have real-time interactions with a wide range of dealers fluent in your native language. High rollers can play live blackjack for £2,000 a hand or live roulette for £100,000 a spin. Penny players can bet in increments of £5 for live blackjack, £0.10 for auto roulette, or £20 for French roulette. Live baccarat bets range between £1 and £10,000, while Baccarat Squeeze has wagers between £5 and £10,000. New players receive a £1000 bonus when making your first deposit at Betway Casino. Test out Betway Live Casino with free play cash to see which of the great games you prefer. If you cannot play at Betway Live in your jurisdiction, try 888’s Live Casino’s live dealer online blackjack. 888casino also uses Evolution Gaming for its live casino, so you’ll find a similar set of games. High stakes players will find the highest bet limits in the business, while penny players can wager for minimum bet limits as low as £0.10 per hand. Most games have low limits in the £1, £2, or £5 range, depending on the variant of the game you play. Live Roulette, Live Baccarat, Live Blackjack, and four types of live table poker are available. What separates 888 Live Casino apart at the moment is its huge £20k welcome bonus. The “Cool Winter Bonus” effective throughout the early winter of 2018 is a £20,000, 20% offer. When you make a deposit, use the coupon code LIVEWINTER and receive up to £500 in bonus money. This bonus is redeemable up to 40 times, so you can unlock as much as £20,000 when using the LIVEWINTER promo code. This bonus offer only has a 30x playthrough. You’ll have 90 days to match the playthrough requirements, which is much longer than most wagering requirements. Remember to deposit at least £20 to activate this offer. Players from the United States have a totally different playing situation. Due to the UIGEA, sites like Betway and 888 Casino do not operate in most of the USA. Over time, a series of online casinos like Sportsbetting.ag and Golden Lion Casino have stepped into the breach. Thanks to excellent software developers like Global Gaming Labs (GGL) and Vivo Gaming (ViG), real money players now have a lot of live dealer casino choices. Here’s the best of the bunch. Sportsbetting’s online blackjack live dealers accept bets between $10 and $2500, so you should find the bet limits perfect for you. Sportsbetting.ag uses Vivo Gaming software to provide world-class live dealer games from studios around the globe. Sportsbetting Live Casino provides blackjack, roulette, baccarat, and Super 6 baccarat using live dealers who are streamed live in real time to your computer screen. Live blackjack has several betting levels, including tables between $10-$500, $15-$1000, and $25-$2500. Sportsbetting live roulette has three selectable table limits: $1-$100, $5-$500, or $25-$5000. Play live roulette for as little as $1 or as much as $5000 per spin. The site’s live baccarat has limits similar to live blackjack: $5 to $100, $25 to $500, and $250 to $5000 bet limits. Sportsbetting’s Live Super 6 tables have the same betting options: $5-$100, $25-$500, or $250-$5000. Each game has at least 2 tables open all hours of the day. Sportsbetting Casino offers a $25 risk-free bet in the live casino while offering Live Dealer Leaderboards for loyal customers. The monthly leaderboard has 3 tiers, so even low rollers might win prizes each month. Sportsbetting.ag’s deposit bonus is 100% between $50 and $1000. Golden Lion Casino provides live real money blackjack for English and French speakers alike. Golden Lion Live Casino is powered by Vivo Gaming, so you’ll be able to play live baccarat, live blackjack, live roulette, and live Super 6 baccarat. Golden Lion’s bet limits range between $1 and $5000 for most games, much like Sportsbetting.ag. Vivo Gaming began operations in Florida but has studios in Costa Rica, the Philippines, and Laos. Players from the United States, UK, Australia, and South Africa will enjoy Golden Lion Casino. One thing their customers get is support for a variety of currencies, including U.S. dollars, Australian dollars, Euros, Pounds Sterling, and the South African Rand. Canadian players are not allowed at Golden Lion, but most other English speakers should enjoy the live casino. New depositors can accept one of a variety of offers: a 175% table games bonus (code: CARDCHAMP), a 150% slots and table games bonus (code: CHAMPION), or a 50% to 100% cashback bonus (no code required). New signups also receive a $25 no-deposit bonus.